Giorgos Papoutsoglou was born in Athens, Greece. He received the Bachelor and Master in Engineering degrees from the Electronic and Computer Engineering School of the Technical University of Crete, Chania, Greece, in 2005. In 2007 and 2014 he received the Master of Science in Engineering and the Doctor’s of Philosophy degrees from the same School. He has been working as a Research Scientist at the Bioinformatics Laboratory in ICS-FORTH and, currently, at the Computer Science Department of the University of Crete. During his studies he has attended a number of international long-lasting seminars, organized by EU Universities, in the fields of his research. For his Ph.D. research Dr. Papoutsoglou has been awarded with a fellowship by the EU/Greek doctorate support program “Heraclitus”. He has also served the ECE School as a Teaching Assistant. 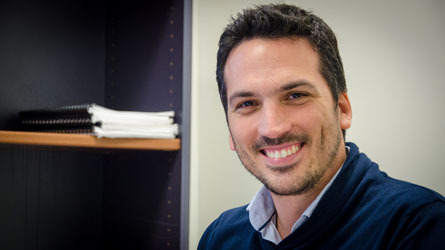 His research interests include dynamic contrast enhanced optical imaging, system’s biology, pharmaco-kinetic/dynamic compartmental analysis and modeling, parameter estimation methods in dynamic biological processes, methods of causal inference from time-series observational data and induction of graphical models from biomedical data.